This very dark milk chocolate bar is wonderfully creamy and smooth as it melts on your tongue. With notes of cappuccino and roasted nuts this is a delight for those who love their chocolate, and their coffee, complex. The Congo is one of the world’s most devastated and poorest places. For women and girls living there the position is incredibly difficult. Almost all are confined to a combination of agricultural work, gathering water and firewood and, inevitably, child rearing and child care. Girls are always the first ones to drop out of school. Violence against women has become a normal aspect of day-to-day reality even at the household level. 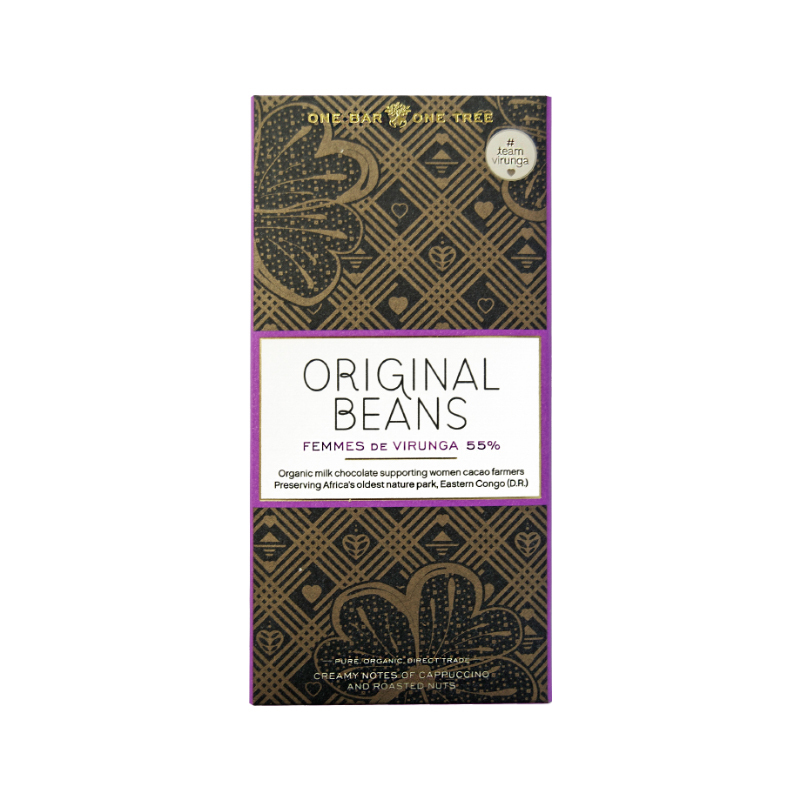 In 2008 Original Beans kicked off a partnership with a few hundred women to grow cocoa and achieve a direct trade price premium. These women, and their bars, are know as the Femmes de Virunga. They have planted more than a quarter of a million cacao trees and approximately 40 thousand shade trees. And in late 2016, these women founded one of the world’s first women cacao cooperatives. 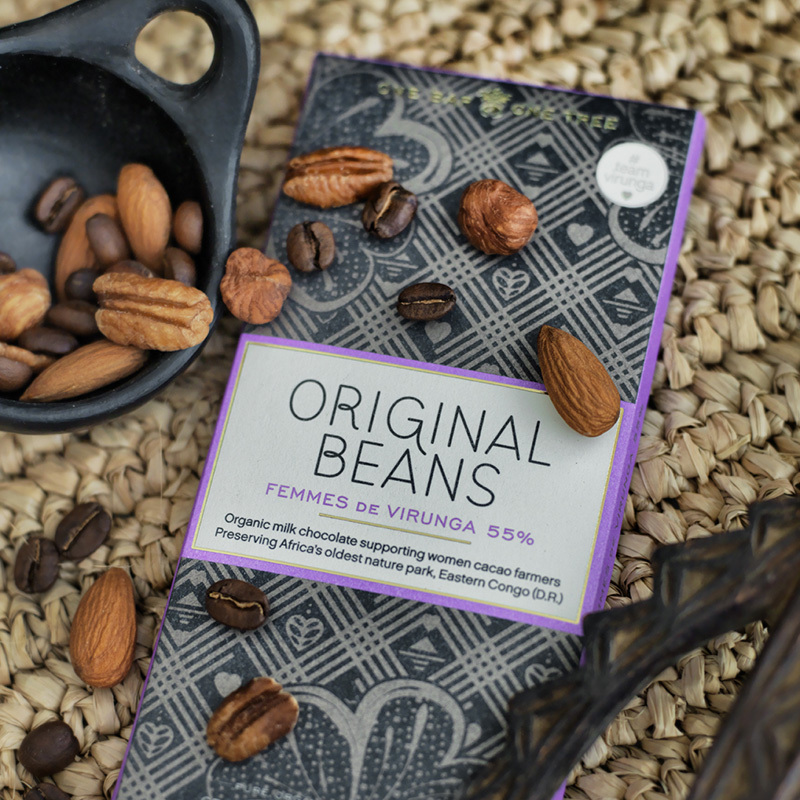 So not only does this bar taste great, but it does great – helping women in the Virunga park, And in addition, for every bar sold Original Beans donate a cocoa tree to a cacao farmer in Virunga helping preserve the rainforest. As sweet and creamy as a frothy latte, but with a cherry edge to prevent it from being sickly, this is certainly one of the best milk chocolates I've ever tried. The notes of hazelnuts, toffee, milk and raisins along with the more prominent and lingering cherry and coffee make this a delightful milk chocolate to nibble on.